Do we have Asbestos in Calgary Homes? Almost every week at our brokerage office we have a speaker that helps to keep us on top of trends in the real estate industry. This week's topic was "Asbestos in Calgary area homes." Specifically, what asbestos is, what types of homes will we find it in and what should buyers and sellers do about it. Today's speaker was the CEO of Western Asbestos Removal Inc. He is definitely a subject matter expert, but it was a bit of a sales pitch just the same. Asbestos is fibrous mineral, that if inhaled can cause life threatening lung diseases. 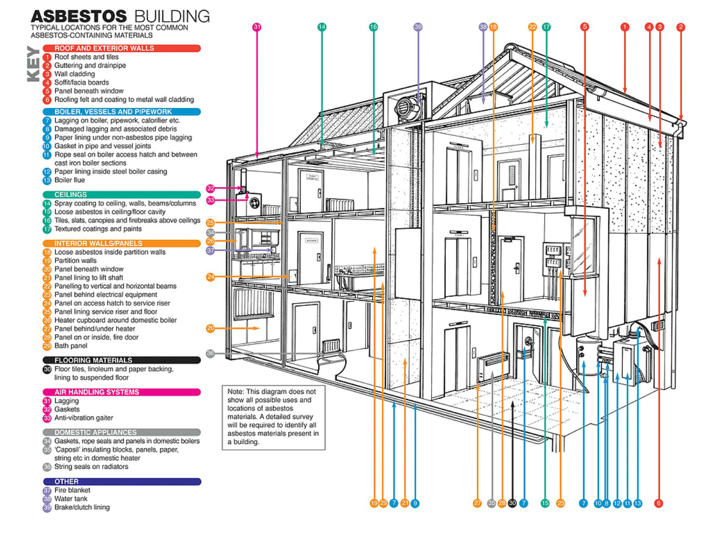 Until banned, asbestos was used in more than 2000 building materials. Homes built before 1990 possibly contain asbestos materials somewhere. Homes built before 1980 almost always contain asbestos materials somewhere. Asbestos containing building materials, when disturbed, can release asbestos fibres into the air where they can be inhaled. When found, it's best to properly and safely have asbestos removed. If left undisturbed it poses little threat, but when the home is eventually renovated, it will need to be dealt with properly. In some areas of the country, new laws now make it impossible to get building permits without proving that you have tested for and properly removed any asbestos found before work starts. Always consult an asbestos professional if you think you may have found asbestos in your home. Is suspecting having asbestos in a home cause enough to disclose a Material Latent Defect? I'm not sure since, if left undisturbed, it apparently poses little risk. Asbestos may pose less risk than aluminum wiring, urea-formaldehyde foam insulation or remediated grow-ops which are not required to be disclosed as Material Latent Defects in Alberta. I do know that if a home owner knows for sure their home has asbestos in it, as always, they should check with their real estate lawyer as to whether they should disclose and, if so, at what point in the purchase process. Having been present for about a hundred home inspections, I can attest that home inspectors indicate that asbestos may be present in homes built prior to 1980 and that if a potential buyer has a concern about it, then they should have a specific asbestos inspection (similar to if the potential buyer has a specific concern about the wiring in a home, they should call a licensed electrician to investigate further). Home inspectors do a visual, non-invasive over-view of the entire home (not the entire property, yard or detached buildings – just the home). Home inspectors find issues. They always do. It is then up to the potential buyer to investigate further on any of the issues found in their determination of whether to purchase a home or not. Today, the cost of a home inspection is between $400 and $800 (depending upon the home's size) and take between 2 and 4 hours to complete. The cost of a home inspection is borne by the buyer. Most buyers take the home inspection as a "snap-shot" of a home and have an understanding of what they may need to repair or replace one they take ownership of it. Potential home buyers should not rely on a home inspection completed by a home seller pre-sale. A buyer is not in a contractual relationship with the seller's home inspector and would have no recourse should there be an error or omission in the report. Today's guest speaker indicated that asbestos inspections can be completed in a similar time-frame to a home inspection and can be accomplished during the same condition period should a potential buyer wish to have one completed. Like a home inspection, it would need a contingency (or condition) placed into the standard purchase contract to allow the inspection and detail when and who will complete it. As a general rule of thumb, any home within the Calgary area that was built prior to about 1980 should be expected to contain some asbestos. Entire areas of the city were built prior to 1980. So, any home in neighbourhoods such as Lake Bonavista, Willow Park, Charleswood, Pineridge, Whitehorn, and dozens more, would have asbestos in the homes, businesses and schools – unless the asbestos has already been abated and removed. The certification of these homes as being "asbestos-free" would clearly add some value. Since the cost of removal can be in the range of $15,000 to more than $75,000, it is not a small consideration. The lack of certification wouldn't devalue a home since market value has already been established in these neighbourhoods and it is assumed that they all currently have asbestos in them. These potential costs should always be a consideration should a home-owner be considering a renovation. It is probably not a determination of whether asbestos removal is required as much as it is how much removal is required. In summation, it is clearly worthwhile to purchase a home that has been "certified asbestos-free," but how much more is it worth than a home that hasn't been abated? I don't know. Will this impact resale value? Possibly, in the future when the norm is that the majority of homes built prior to 1980 have been abated and certified. The issue here, of course, is will a current home-owner take the legal risk of claiming their home is asbestos-free after a testing firm has certified it as such? Making that claim would make them liable for future law suits should someone years in the future find asbestos in something in the home. If you are concerned with asbestos in homes, you should probably read my blog post on Radon gas. Thank you for an excellent article! I am very glad that this topic is being discussed. Many people do not even suspect that asbestos is harmful to health. Thanks to such articles people will learn about this danger! We just have to talk about it! Notify residents of our city. Canada is on the right track in the fight against asbestos. It is very good! More about asbestos can be found in Wikipedia https://en.wikipedia.org/wiki/Asbestos I am a medic, and I understand very well how dangerous asbestos is. In addition to your article, I would like to talk a little more about this from a medical point of view. In the mechanical destruction of products that contain this mineral, asbestos dust is formed, which penetrates into the lungs. Asbestos poisoning is not immediately apparent, as dust gradually accumulates in the body. In most cases, the negative impact of the mineral is manifested in 6-10 years and even more. Most often, the harmfulness of asbestos is the development of bronchitis and asbestosis. This is due to the fact that, passing through the bronchi, dust particles settle on their walls, which leads to irritation of the mucous surface. Asbestosis is a heavier disease, which is accompanied by the deposition of dust inside the lungs, which leads to the formation of scar formation on the surface of the respiratory organs. When removing asbestos, we get poisonous dust particles. Asbestos removal technologies are also an important topic for all of us. This requires caution and special skills. I would like to warn the inhabitants of Calgary about the difficulties and the dangers of removing asbestos on their own. The Government of Canada warns of the potential dangers of asbestos and suggests ways to keep you and your children safe. They also stress the importance of not contacting this material yourself, and instead emphasize the importance of using trained professionals: “If asbestos is found, hire a qualified asbestos removal specialist to get rid of it.” (citation: https://astra-management.ca/asbestos ) How does the Government of Canada protect you from exposure? The Government of Canada recognizes that breathing in asbestos fibres can cause cancer and other diseases. We help protect Canadians from asbestos exposure by regulating: the sale of certain high-risk consumer products made of asbestos or that contain it this is done through the Asbestos Products Regulations under the Canada Consumer Product Safety Act possible releases of asbestos into the environment this is done through the Asbestos Mines and Mills Release Regulations under the Canadian Environmental Protection Act, 1999 (citation: https://www.canada.ca/en/health-canada/services/air-quality/indoor-air-contaminants/health-risks-asbestos.html ) After reading all the information on this, we must be cautious and active in the fight against asbestos! Thanks again for the article! Absolutely asbestos is a reality (and a scary one at that) here in Calgary. I have multiple calls every week from realtors and home inspectors who want a quote for asbestos abatement - not as an actual request to perform the work, but because they want to use it as a bargaining chip when purchasing the home. It is always better to know in advance if there is asbestos present prior to selling your home to prevent this from becoming an issue that could cost you thousands in your final sale price. inspections and testing can be done very quickly, in fact www.amityenvironmental.ca guarantees a 24 hour turnaround on results!